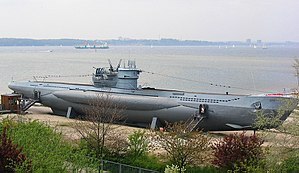 U-995 Type VIIC/41 at the Laboe Naval Memorial. This U-boat is almost identical to U-1301. German submarine U-1301 was a Type VIIC/41 U-boat of Nazi Germany's Kriegsmarine during World War II. She was ordered on 2 April 1942, and was laid down on 20 January 1943, at Flensburger Schiffbau-Gesellschaft, Flensburg, as yard number 494. She was launched on 22 December 1943, and commissioned under the command of Oberleutnant zur See Karl-Heinrich Feufel on 11 February 1944. German Type VIIC/41 submarines were preceded by the heavier Type VIIC submarines. U-1301 had a displacement of 769 tonnes (757 long tons) when at the surface and 871 tonnes (857 long tons) while submerged. She had a total length of 67.10 m (220 ft 2 in), a pressure hull length of 50.50 m (165 ft 8 in), an overall beam of 6.20 m (20 ft 4 in), a height of 9.60 m (31 ft 6 in), and a draught of 4.74 m (15 ft 7 in). The submarine was powered by two Germaniawerft F46 four-stroke, six-cylinder supercharged diesel engines producing a total of 2,800 to 3,200 metric horsepower (2,060 to 2,350 kW; 2,760 to 3,160 shp) for use while surfaced, two AEG GU 460/8-276 double-acting electric motors producing a total of 750 metric horsepower (550 kW; 740 shp) for use while submerged. She had two shafts and two 1.23 m (4 ft) propellers. The boat was capable of operating at depths of up to 230 metres (750 ft). The submarine had a maximum surface speed of 17.7 knots (32.8 km/h; 20.4 mph) and a maximum submerged speed of 7.6 knots (14.1 km/h; 8.7 mph). When submerged, the boat could operate for 80 nautical miles (150 km; 92 mi) at 4 knots (7.4 km/h; 4.6 mph); when surfaced, she could travel 8,500 nautical miles (15,700 km; 9,800 mi) at 10 knots (19 km/h; 12 mph). U-1301 was fitted with five 53.3 cm (21 in) torpedo tubes (four fitted at the bow and one at the stern), fourteen torpedoes, one 8.8 cm (3.46 in) SK C/35 naval gun, (220 rounds), one 3.7 cm (1.5 in) Flak M42 and two 2 cm (0.79 in) C/30 anti-aircraft guns. The boat had a complement of between forty-four and fifty-two. On 9 May 1945, U-1301 surrendered at Bergen, Norway. She was later transferred to Loch Ryan, Scotland on 2 June 1945. Of the 156 U-boats that eventually surrendered to the Allied forces at the end of the war, U-1301 was one of 116 selected to take part in Operation Deadlight. U-1301 was towed out and sank on 16 December 1945, by bombs from British aircraft. The wreck now lies at 55°50′N 10°05′W﻿ / ﻿55.833°N 10.083°W﻿ / 55.833; -10.083Coordinates: 55°50′N 10°05′W﻿ / ﻿55.833°N 10.083°W﻿ / 55.833; -10.083. ^ Helgason, Guðmundur. "Karl-Heinrich Feufel". German U-boats of WWII - uboat.net. Retrieved 31 March 2016. ^ Helgason, Guðmundur. "Paul Ehrenfried Lenkeit". German U-boats of WWII - uboat.net. Retrieved 30 March 2016. ^ a b c Helgason, Guðmundur. "U-1301". German U-boats of WWII - uboat.net. Retrieved 30 March 2016. ^ a b Gröner 1991, pp. 43-44. This page was last edited on 17 June 2017, at 02:00 (UTC).